I've just started crocheting. Do you think I could figure out one of your patterns? I always answer the same way. If you know basic crochet stitches, why limit yourself to washcloths and scarves? I mean, I love making quick scarves and little washcloths as much as the next guy, but if you see something awesome, and you think, "I wish I could make that! ", then just make it! Learn as you go! But you know, after crocheting enough inside out octopuses and figuring out where the hook was actually supposed to go, I got it! I'm not claiming to be the authority on all things crochet by any means (hairpin lace, huh?? ), but I feel like I've figured out my niche. I watched enough youtube videos and photo tutorials that I finally got the hang of it. Here's a photo of the first thing I ever actually crocheted and finished. A little blue bear. I think he's pretty cute. Imperfect, but cute. See how I was, um, "unconventional" with how I made single crochets? I love that the most popular post I've ever done here is my beginner amigurumi pattern for Baby Monsters. That means lots of beginning crocheters are making some amigurumi! I get lots of questions about how to dress them up a little with feet like some of the ones in the photo. That's easy! At the end of the last round, do not fasten off. Make 3 dc into the front loop only of the next 2 stitches, sl st into the next 4 stitches, 3 dc into the front loop only of the next 2 stitches, sl st into the next st, and fasten off. Feet! If you're a beginner, these are fun to make, but you'll want to move on, right? 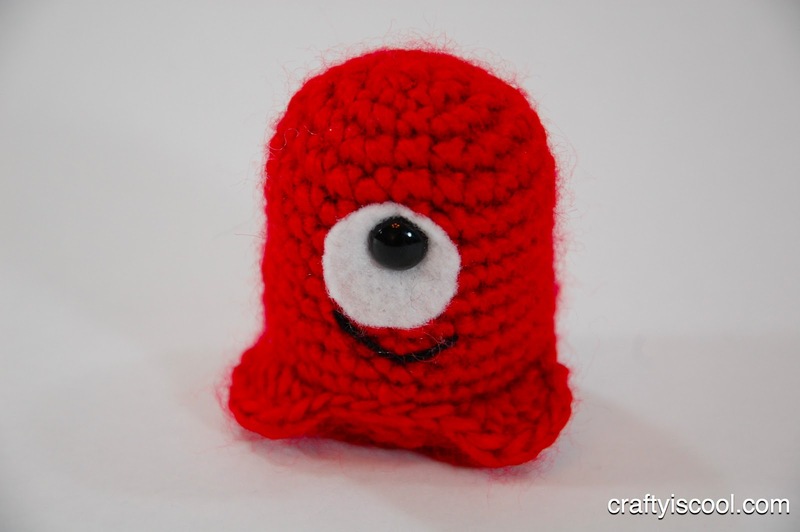 I think my book, AmiguruME: Make Cute Crochet People, is going to be a great book for all levels. I opted to include step by step photos in the how to section. I really focused on the adjustable ring method for crocheting in the round. I want everyone to learn it! I also made sure that all of the examples in the how-to section are made on "in the round" swatches. I think it makes a difference. You can preorder my book from Amazon or Barnes and Noble, Amazon UK, Bookworld for Australian shoppers, as well as other places. I'm really excited about it, and I hope you will love it! I cannot wait to see people start posting their projects online. I want to see them all! The possibilities are endless so there won't be any two dolls exactly alike! If you're planning on getting my book, what doll would you make first? A celebrity? Your kids? A gift for a teacher? I love your monsters I will have to make one someday. And I absolutely LOVE your dolls! You do such a FANTASTIC job on making them. I just can't wait until your book comes out! Oh and you were asking about who we would crochet first, well I don't have any kids yet so I will probably make my parents or grandparents or my siblings. But the next people I will make are characters from movies. And than I'll make celebrities. I really can't wait for your book to come out! Thank you so much for writing the book. Your crochet people are wonderful! And they look just like the real people or characters. oh wow, im going to HAVE to buy that book! amazeballs. i get frustrated with people who give up on crochet so quickly - as with anything it takes practice! I went to an amigurumi class last December and loved it! I've so far made two small ones and need lots more practice. Would love to get your book too! hehe, I read the title as "I hate beginners" at first! I can't wait for your book!! I agree, I tried amigurumi by trial and error and following instructions from the web. I too did my first (quite a ) few inside out. It was only when I was trying to do the invisible decrease that I realised everything was inside out. Oh well, no one else around me knows, unless I tell them. I love the things that you do, but is there a way to remove the heart backgound so that we can more easily read the printing? I don't intend to sound mean or offensive in any way, but I find it very distracting. So love your mini-monsters! Thank you for sharing. I absolutely love your patterns! I was first attracted by your Doctor Who patterns and bought several after I had the full set of them. As soon as I found out about your book I had it preordered on Amazon. LOVE! The book just arrived a couple days ago and I'm slowly starting to make myself a little spokesdoll. My mother wants me to start selling some dolls at the local market and I couldn't think of a better spokesdoll than a miniME! I will slowly be posting updates as I build myself on my blog Knotwork Sanctuary and am already having a ball with it! I made a mistake and bought the wrong size wire... but there's nothing wrong with a little trial and error! Also... if you have a moment, could you direct me to someplace that sells 10mm safety eyes? I can't seem to find them anywhere ;_;. I love your work! I saw your Bob Ross on a pinterest email and decided it was time to learn to crochet. I knit right now, so thinking that might help a little. 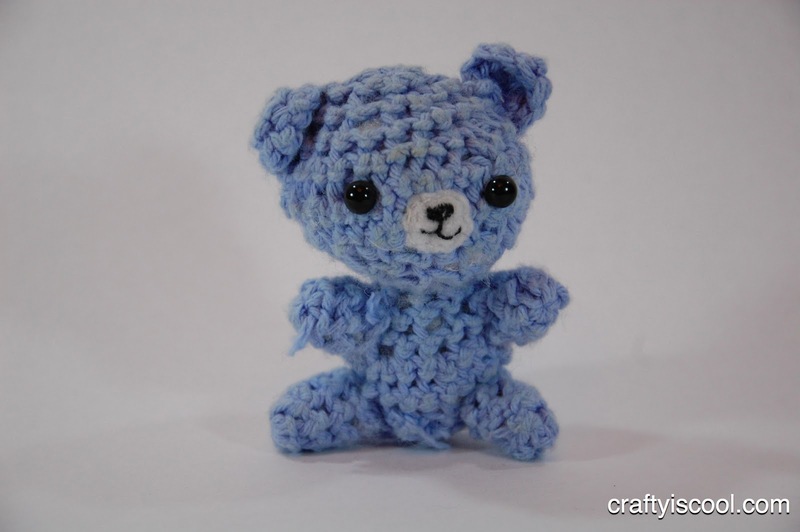 I've watched some YouTube videos on crocheting Amigarumi and that has been quite helpful. I've now crocheted the head and body, but the hands I'm having trouble with...wondering if you can recommend a video to help? It's so tiny and easy to lose track of stitches and hard to find them...I really want to make this doll for myself and friend, we're both painters!! She's going to paint paintings for our dolls. Any suggestions you have would be greatly appreciated. Wonderful work, just love all your patterns and want to crochet more after I do my first doll of Bob Ross. Love these little monsters!! I saw your book at my public library, and I know I want it on MY shelf! The "wigs" for the dolls was a big Ah-ha! for me... no wonder I couldn't get the hair effects I wanted! Can't wait to play with dolls again! Allison Haufman, I have a question about your little monsters. First off, I love these guys, they are so quick to make. I wanna add the feet to mine, so...which side do I put the feet on? The body or the base? My booboo, I misspelled your last name. Hoffman. Sorry.